Precious Priscilla, what a lady! Well, most of the time... Pretty much like all our wonderful animal friends. 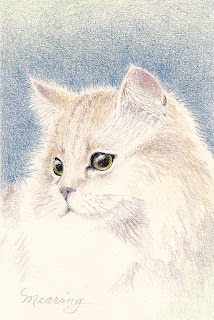 Colored pencil is a 'natural' for doing fur. ﻿This is a 6" x 4" drawing. Hens and Chicks or Houseleeks? The Latin name 'Sempervivum' means ever living and we know them as carefree and lowly garden plants, easy and fun to propagate and share with friends. 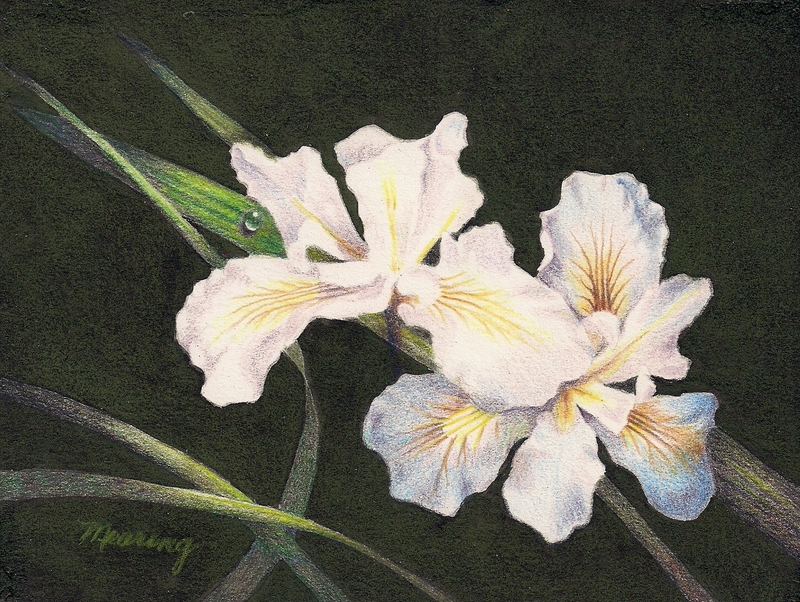 Mother nature has blessed them with a subtle tapestry-like beauty. 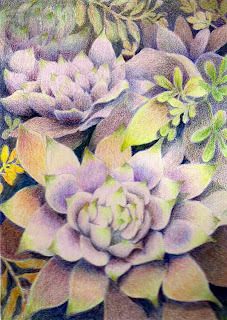 I took the photo in my garden last summer and enjoyed doing this 7 x 5 colored pencil painting in the cold of winter. 7 x 5 and has become part of my 2010 Christmas card collection. The original has been SOLD. 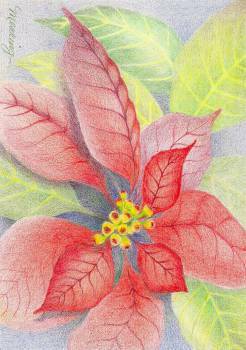 This lovely plant, a native our of neighbors to the south is arguably the most beautiful secular symbol of Christmas. The bright red leaves are what attract us rather than the simple yellow 'flowers', the sap is poisonous, and most people mis-pronounce it, leaving out the final 'i'. 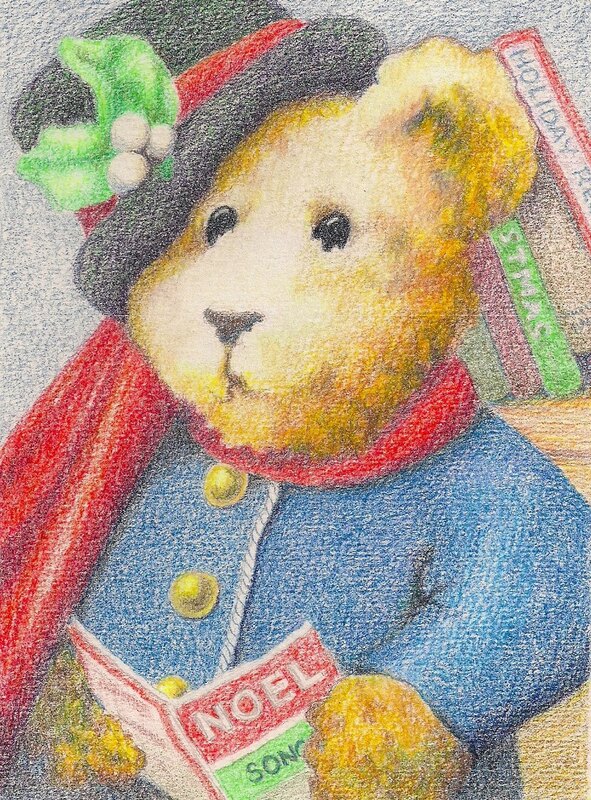 Painted here in colored pencil it is 5 x 7 and part of my 2010 Christmas card collection. The original has been SOLD. Imagine capturing a rainbow and growing it in your garden. 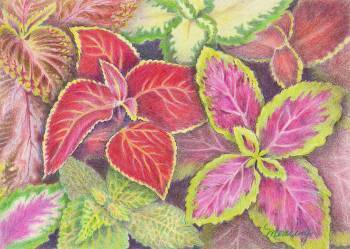 The colored foliage of Coleus is every bit as colorful and beautiful as flowers and more unexpected! This little painting is in colored pencil. 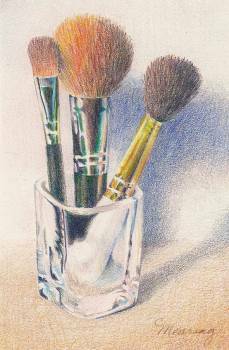 'Garden Rainbows' is just 6 x 8 but is a lovely spash of pinks and roses.